Today I am celebrating the END of Halloween-hype, Red Ribbon Week furor, progress report deadlines, and a month that moved at a hectic pace! How about you? Parent-Teacher conferences are over and the pace at school slows down a bit. 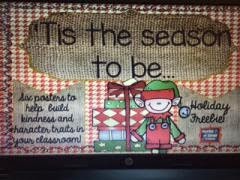 Lesson themes turn to what we are thoughtful and thankful for, and visions of sugarplums start to dance in our heads. It is just a happier, more laid back time.....and honestly I am ready for it! As I link up with Farly over at Oh Boy 4th Grade, I am especially grateful because this month marks my first anniversary as a bonnified blogger! 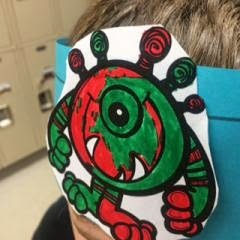 Know that I am so glad to be part of this teacher-author community, and welcome you here to my little corner of the world where what is going on in my classroom and personal world are shared honestly and openly. For those who follow me, you know that putting Brutus to sleep due to a herniated disc and paralysis at the end of August truly "rocked my world." The past two months have been a time of adjustment for both me and Rosie, be we are finding our way with each other. "The Beast" was just cuddly, constant, and incredibly loyal. Rosie has always been more reserved and low-maintenance, but she is currently zonked out at the end of my bed, instead of hiding under it, and has started to wiggle her way onto my pillow to wake me up in the morning. "Falling back" an hour was very welcome after a fast-paced school week full of sugared-up children! One highlight of Halloween day though was a classroom visit from my son who played guitar for and answered questions from my students! It always makes my heart swell when he tells them "you have to practice to be good at anything, so do your best in school!" exhausted and maybe just at LITTLE bit crabby at bus time, that's for sure! Snickers therapy was the order of the day, as was an early evening nap! Last night's extra hour of sleep was much-needed and well-deserved! I am waking up slowly today, and am feeling kind of hungry for some good, old comfort food instead of my customary granola bars. A trip to the McDonald's drive-thru just might be in order--and yep, I will have TWO hash browns with that Sausage McMuffin--and I will feel no shame! Both will give me the sustenance and fortitude needed to put the finishing touches on my conference folders. I only have 18 meetings over the next two days, and they are fairly spaced out time-wise, but I just always fret myself into a tizzy beforehand. Once I've talked with a few parents, I get in a rhythm and relax, but getting to that point is always stressful for me. Maybe I will set up a work-some-and-then-reward-myself system today, where I complete one hour of school tasks and then take a break for either TpT-creating or reading?! 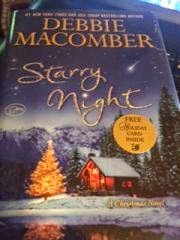 I just love Debbie Macomber's novels, especially her holiday series, and this one is about a cozy cabin in the Alaskan wilderness where a journalist and a reclusive author are stuck together in a snow storm. I just love a good winter romance! freebie I just uploaded to my store! I just love the homespun texture it adds! As always, thanks for sharing my story! Keep calm and continue to teach your children well! 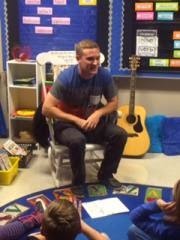 How lovely that your son came in to play and take questions with your class! That looks like a lovely wintery read - I'll have to check it out (my list is growing very long reading all these currently posts!). My adult children are always well-received guests in my room! It makes me proud for them to be able to come and mentor my students! Thanks for commenting, Pixie Anne! I am just home from McDonald's, Elyse! My heart and tummy are happy! Sometimes we just have to indulge ourselves! Enjoy your Sunday! This is my first time reading your blog. I enjoyed reading it! Congratulations on your blogging anniversary of sorts. We have something in common in that we both enjoy using music in our classroom. It is something I use daily. My week was similarly hectic - Red Ribbon Week, Halloween, and conferences. I applaud you for making it through with a great attitude! Thank you for sharing. Glad to know you survived too, Shane! Keep making music with your students! It is an important part of our day in Room #2! 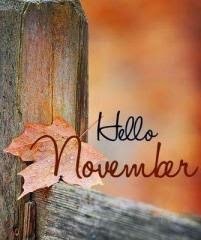 I cannot believe it is November! Thank you so much for the awesome clipart suggestion. I love burlap...in fact, I just bought some today!! !